Stars of “The Golden Girls.” (L-R) Rue McClanahan, Estelle Getty, Bea Arthur, Betty White. Women must stretch fewer dollars over more years than men, leaving them 80% more likely to wind up in poverty at age 65 and older, according to a report released Tuesday by the National Institute on Retirement Security. Some 9% of U.S. women age 65 and older — and 5% of men — live at or below the federal poverty level, which is just $11,880 for individuals and $16,020 for a family of two. Many more have trouble meeting their basic living expenses, according to the report. “Women have complicated math problems to solve for,” said Kim Mustin, co-head of global distribution for BNY Mellon Investment Management, who participated in an advisory committee for the report. These include their increased longevity, time spent out of the paid workforce, and wages that still lagged behind men’s by 21 cents per dollar in 2014, according to the report. 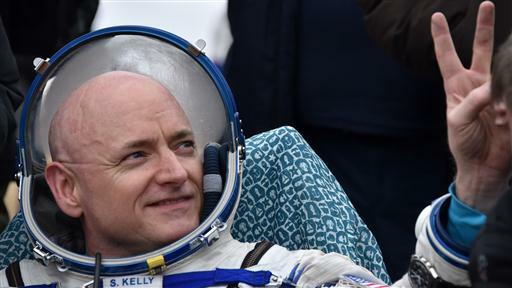 After nearly a year in space—the longest single space flight by an American—NASA's Scott Kelly returned to earth Wednesday with his Russian cosmonaut colleague, Mikhail Korneinko. A woman turning age 65 today can expect to live, on average, until age 86.6, while a man turning 65 can expect to live two years less, according to the Social Security Administration. Meanwhile, a never-married man age 65 and over lives on a median income of $28,250, versus $25,790 for a never-married woman, according to the report, which analyzed U.S. Census survey data. The income disparity is greater for widows and divorced women. Widowers aged 65 and over live on a median annual income of $30,620 versus $23,990 for widows. Divorced men age 65 and older live on an annual median income of $36,910, versus $27,600 for divorced women of the same age. Future retirees may fare even worse, since fewer will have guaranteed income from pensions than today’s retirees. Female workers of all ages had median 401(k) account balances of $24,446 in 2014, versus $36,875 for males, among Vanguard’s plan participants. Women sock away less despite being 14% more likely than men to participate in their workplace savings plan, according to Vanguard, and despite having similar asset allocations to men, with an average of 73% of their 401(k) in stocks to men’s 74%. Various policies have been proposed to close the retirement income gap, from increasing workers’ access to retirement savings plans to a proposal by presidential candidate Hillary Clinton to expand Social Security benefits for widows and those who took time out of the paid workforce to care for a child or sick family member. Women can also take matters into their own hands and plan for a lengthy retirement either on their own or with the help of a financial adviser, Mustin said.